Did you know that lavender has properties that can reduce stress? Or that peppermint can help with headache relief? Essential Oils have been around for over 5000 years. They are becoming more popular and widely used in our modern life. You may have heard about them from a friend, co-worker or family member. Nowadays, most everyone is looking for natural, organic and eco-friendly solutions to embed into their routines. Extracted from plants and trees, oils are distilled to give you the purest form and fragrance to be used for their aromatherapy and topical effects. Having an oil that is guaranteed to be 100% pure and therapeutic grade is what you should be looking for when choosing oils to diffuse and apply topically. It's astounding to learn just how essential oils can help you throughout your life. More and more corporations are looking at ways to reduce stress and anxiety, while boosting productivity in your life at work and home. Diffusing in the office or at your desk with scents like stress away, peace and calming and lavender can help relieve stress and tension in the work environment. You can even utilize oils like peppermint to help neck pain or try applying valor to your back to ease all the aches and pains from sitting at your desk all day. How to use essential oils in your everyday life to help with stress, headaches and other ailments.  Participants will smell jars of some of the most popular oils with printed information on the benefits of those oils displayed while a diffuser will be running with a relaxing blend during event. Participants will create their own blends to take home with them along with information on the oils themselves and how to use them. Class should be held in a conference room.